We spent this past weekend in Chattanooga, TN visiting a very good friend of Amy’s and on the way back we stopped at Benton’s Country Ham in Madisonville, TN. 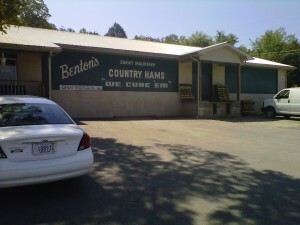 Benton’s is perhaps the most famous, most sought after bacon and country ham producer in the United States. Their pork is featured at the finest and most expensive restaurants in the country starting with Per Se and working your way down. Yet Benton’s could not be more unassuming. Many years ago when Paul Prudhomme ruled Chef-dom and Andouille sausage was all the rage, a butcher shop near my hometown was very much sought after, Cox’s Meat Market. 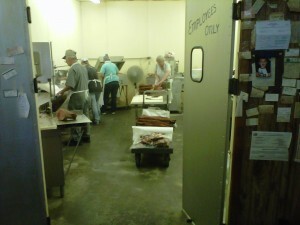 Cox’s, in Reserve, LA, was a butcher shop through and through and I loved going in there. Dale Cox always had a bloody apron on and often he was in the middle of pushing a side of beef across his band saw. He sold pork, beef chicken and his own sausage and tasso ham that he smoked in the back. And get this, his beef was always grass-fed which he got from a supplier in east Texas. 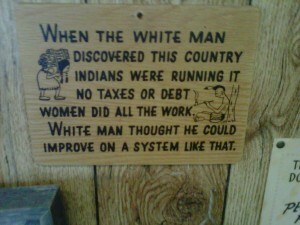 And this was way back in the 70’s. His building wasn’t much to look at but his business was very robust and his Andouille sausage was a thing of beauty. Benton’s reminds me of Cox’s. On our recent visit a well-dressed couple walked in and was shocked at how rustic (she whispered “dirty”) the place was. What were you expecting lady, Whole Foods? 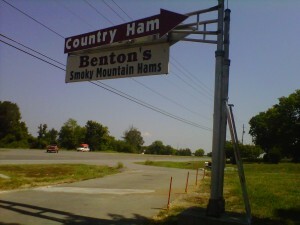 Allan Benton’s Smoky Mountain Hams is in a small town, about a two hour drive from Chattanooga or an hour from Knoxville on US 411. If you ever want to visit, I would recommend starting with Chattanooga over Knoxville. I love Chattanooga, it’s a very cool town, a bit funkier and more eclectic than Knoxville. Would you like a tour of Benton’s? Benton’s is marked by an old railroad post sign that dangles over his parking lot. It’s a very modest building with a large parking lot out front. As soon as you get out of your car, the smell of slow smoked pork fat greets you. It’s quite the wonderful aroma. 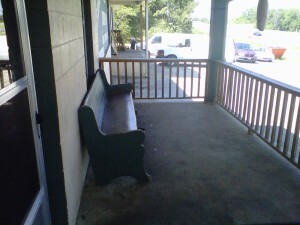 There’s a bench out front if you need to have a seat and sip your soda before heading out. 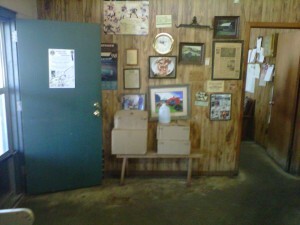 As you walk in the wall on the left side is decorated with flyers and notices from all over Madisonville and surrounding areas. Allan even has a few of his awards hanging in this mix. The floor is concrete and the place feels lost in time by at least 40 years. There’s a dry erase board with the menu on it and there’s a deli case in the front that’s full of cheese and meat along with country ham. On top of that deli case is some local honey and local blackberry jelly made by a neighbor of theirs, Irene Williams. We bought a jar. To the right of that deli case is a rolling rack full of ready to go pork. Ham, pork belly, jowls, tails, etc. It’s right there and it smells so wonderful. On the other side of their single, ancient cash register the Benton’s crew was vacuum packing bacon, ham and pork belly for shipping. If you order from their website, expect a four week wait but if you walk in, you can get anything you want, cash and carry! To the left of their register you can see big wooden dollies full of smoked pork being rolled past your eyes. 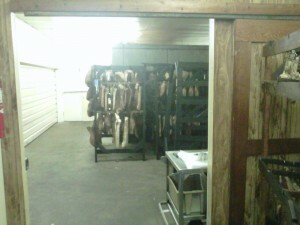 It’s all headed from the smoker to the packing room. 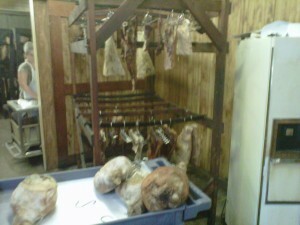 Their Country Hams are cured for nine to ten months before being sold. 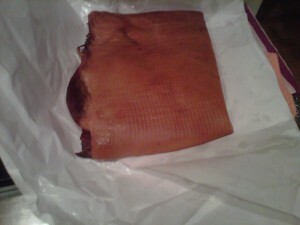 I bought two pounds of sliced bacon, two pounds of sliced Country Ham and a two pound piece of slab Bacon. As soon as we got home Amy made us some Benton’s Bacon BLT’s with fresh tomatoes and Duke’s mayonnaise. Life is very good! great description and the best places are always the rustic ones … you sometimes wonder why some people actually venture out from their sterile surroundings! Once again, thank you John for great pictures and descriptions. These are the places we love where food is fresh and old fashion. 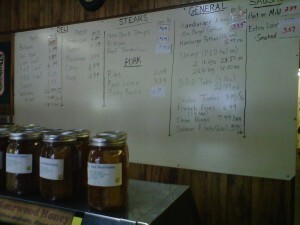 I love the curb market in Hendersonville for fresh vegetables but local meat markets like this are fast going away. Hog heaven! Since one of my kids loves pork, this would be her idea of the perfect vacation! Nice work Chef, our favorite bacon producer in the US.